Dave, Dave he's our man! If he can't save us no one can! With the 2016 election looming, real life politics can seem daunting. I have found solace in one of my all-time favorite movies, Dave. I first saw this movie with friends and loved it so much that the NEXT night I took my family to see it. 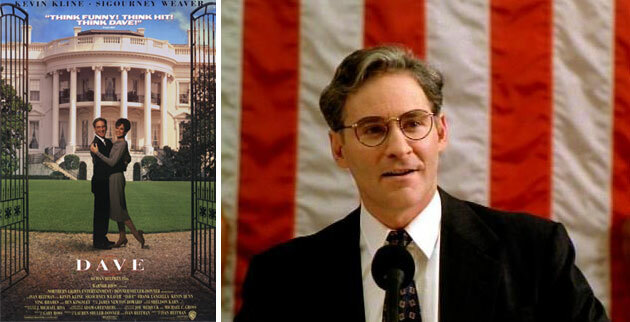 In the movie, Dave (Kevin Kline) is a temp agency owner with a lack of focus but has a great presidential impersonation. So much so that he is hired to be a body double for the President of the United States. And when the President falls ill, Dave is convinced to take his place. The world is told that the President had a “minor circulatory problem of the head.” What?! Well as a newscaster in the movie points out – that is “technically a stroke”. A stroke is caused by lack of blood flow to the brain. It is usually caused by the blockage of a blood vessel (ischemic stroke) or by the rupture of a blood vessel (hemorrhagic stroke). The lack of blood flow leads to brain damage and cell death. It is important to recognize the warning signs of a stroke. A handy way to remember some of them is the mnemonic FAST. Other warning signs that are important to recognize include numbness, confusion, and trouble walking. It will comes as no surprise that Dave ends up saving the day. I won’t spill any spoilers. But I will say if you need a political pick me watch it NOW! I wonder how many times I'll watch it before election day.